However, we have issues with the way some people have applied his work to safety culture. For starters, there is the apparent belief that these levels are related in a linear fashion, more particularly, that management by promulgating and reinforcing the correct values can influence the underlying beliefs, and together they will guide the organization to deliver the desired behaviors, i.e., the target level of safety performance. This kind of thinking has problems. Second, it leads to attempts to measure and influence safety culture that are often ineffective and even misleading. We wonder whether the heavy emphasis on values and leadership attitudes and behaviors - or traits - that the Schein model encourages, creates a form versus substance trap. This emphasis carries over to safety culture surveys - currently the linchpin for identifying and “correcting” deficient safety culture - and even doubles down by measuring the perception of attitudes and behaviors. While attitudes and behaviors may in fact have a beneficial effect on the organizational environment in which people perform - we view them as good habits - we are not convinced they are the only determinants of the actions, decisions and choices made by the organization. Is it possible that this approach creates an organization more concerned with how it looks and how it is perceived than with what it does? If everyone is checking their safety likeness in the cultural mirror might this distract from focusing on how and why actual safety-related decisions are being made? We think there is good support for our skepticism. For every significant safety event in recent years - the BP refinery fire, the Massey coal mine explosion, the shuttle disasters, the Deepwater oil rig explosion, and the many instances of safety culture issues at nuclear plants - the organization and senior management had been espousing as their belief that “safety is the highest priority.” Clearly that was more illusion than reality. * We have mentioned Prof. Schein in several prior blog posts: June 26, 2012, December 8, 2011, August 11, 2010, March 29, 2010, and August 17, 2009. ** This past year we have posted several times on decisions as one type of visible result (artifact) of the many variables that influence organizational behavior. In addition, please revisit two of Prof. Perin’s case studies, summarized here. They describe well-intentioned people, who probably would score well on a safety culture survey, who made plant problems much worse through a series of decisions that had many more influences than management’s entreaties and staff’s underlying beliefs. *** Back in 2006, the NRC staff proposed to enhance the ROP to more fully address safety culture, saying that “Safety culture includes . . . features that are not readily visible such as basic assumptions and beliefs of both managers and individuals, which may be at the root cause of repetitive and far-reaching safety performance problems.” It wouldn’t surprise us if that’s an underlying assumption at the agency. See L.A. Reyes to the Commissioners, SECY-06-0122 “Policy Issue Information: Safety Culture Initiative Activities to Enhance the Reactor Oversight Process and Outcomes of the Initiatives” (May 24, 2006) p. 7 ADAMS ML061320282. Posted by Bob Cudlin 7 comments. Click to view/add. 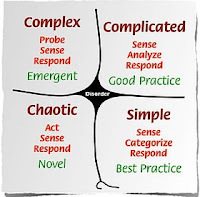 Bob Cudlin recently posted on the work of David Snowden, a decision theorist and originator of the Cynefin decision construct. Snowden’s Cognitive Edge website has a lot of information related to Cynefin, perhaps too much to swallow at once. For those who want an introduction to the concepts, focusing on their implications for decision-making, we suggest a paper “Cynefin: repeatability, science and values”* by Prof. Simon French. 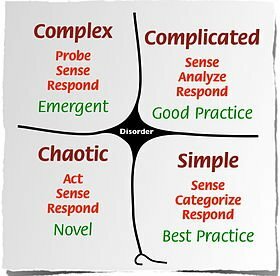 In brief, the Cynefin model divides decision contexts into four spaces: Known (or Simple), Knowable (or Complicated), Complex and Chaotic. Knowledge about cause-and-effect relationships (and thus, appropriate decision making approaches) differs for each space. In the Simple space, cause-and-effect is known and rules or processes can be established for decision makers; “best” practices are possible. In the Complicated space, cause-and-effect is generally known but individual decisions require additional data and analysis, perhaps with probabilistic attributes; different practices may achieve equal results. In the Complex space, cause-and-effect may only be identified after an event takes place so decision making must work on broad, flexible strategies that can be adjusted as a situation evolves; new practices emerge. In the Chaotic space, there are no applicable analysis methods so decision makers must try things, see what happens and attempt to stabilize the situation; a novel (one-off) practice obtains. The model in the 2008 French paper is not in complete accord with the Cynefin model currently described by Snowden but French’s description of the underlying considerations for decision makers remains useful. French’s paper also relates Cynefin to the views of other academics in the field of decision making. For an overview of Cynefin in Snowden’s own words, check out “The Cynefin Framework” on YouTube. There he discusses a fifth space, Disorder, which is basically where a decision maker starts when confronted with a new decision situation. Importantly, a decision maker will instinctively try to frame the decision in the Cynefin decision space most familiar to the decision maker based on personal history, professional experience, values and preference for action. In addition, Snowden describes the boundary between the Simple and Chaotic as the “complacent zone,” a potentially dangerous place. In the Simple space, the world appears well-understood but as near-misses and low-signal events are ignored, the system can drift toward the boundary and slip into the Chaotic space where a crisis can arise and decision makers risk being overwhelmed. Both decision maker bias and complacency present challenges to maintaining a strong safety culture. The former can lead to faulty analysis of problems, forcing complex issues with multiple interactive causes through a one-size-fits-all solution protocol. The latter can lead to disasters, great and small. We have posted many times on the dangers of complacency. To access those posts, click “complacency” in the Labels box. * S. French, “Cynefin: repeatability, science and values,” Newsletter of the European Working Group “Multiple Criteria Decision Aiding,” series 3, no. 17 (Spring 2008). Thanks to Bill Mullins for bringing this paper to our attention.